The one thing I don’t like about mucking about with electronics with the kids is soldering. For a lot of what they want to do it’s simply too final and too fiddly. But there are increasingly some neat alternatives available. Recently, our Senior Primary School Correspondent was called upon to make the autobiography that all Year 6 kids are required to produce ‘more than just words’. His teacher suggested that in previous years people had added fold out pages, or taped in things you could touch. That, however, is not the geek way. 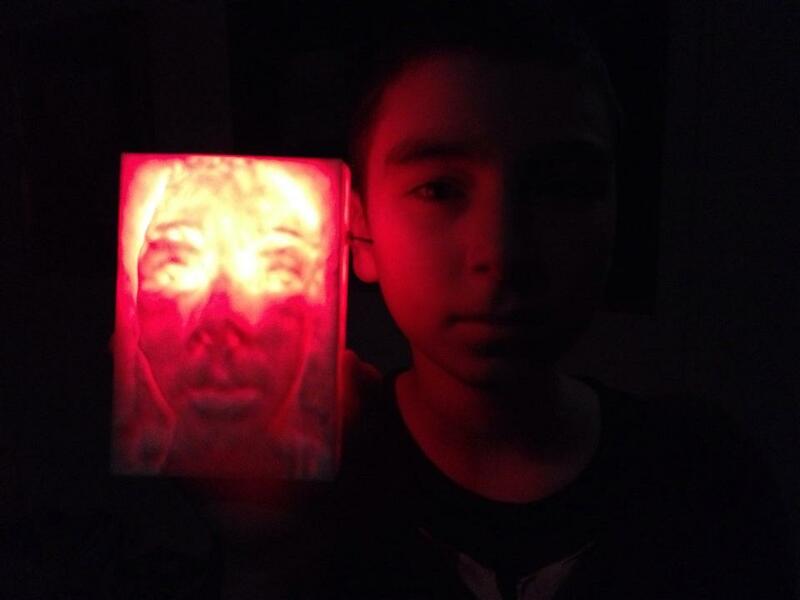 So our young geek took a picture of his face using the Trimensional app, fiddled it in Tinkercad to make it into a box, and then wired in some LEDs connected to a little switch on the side to give the whole thing a lovely, scary glow. Now that is a geeky front cover. All good: But to the point – when I say ‘wired in’ I really mean, used a fragile mess of duct tape to hold all the wires together. That’s even more fiddly and frustrating than soldering would have been, although easier to fix up and involving a lot less really hot stuff. All this is what made me alive to a couple of neat-looking products that floated across my desk in the last few days. First is conductive paint from Bare Paint. Bare Paint is just like any other water-based paint… except that it’s electrically conductive. This means that you can actually paint wires onto things like models, clothes, furniture, walls, almost anything you can think of. Standard acrylic or water-based paints can even be used alongside Bare Paint to act as insulation or to create multi-layer circuitry. It comes in a pen for easy application; and Bare Paint is nontoxic, water-soluble and can be removed with soap and water. What more could you ask for? The second product is still in Kickstarter gestation. 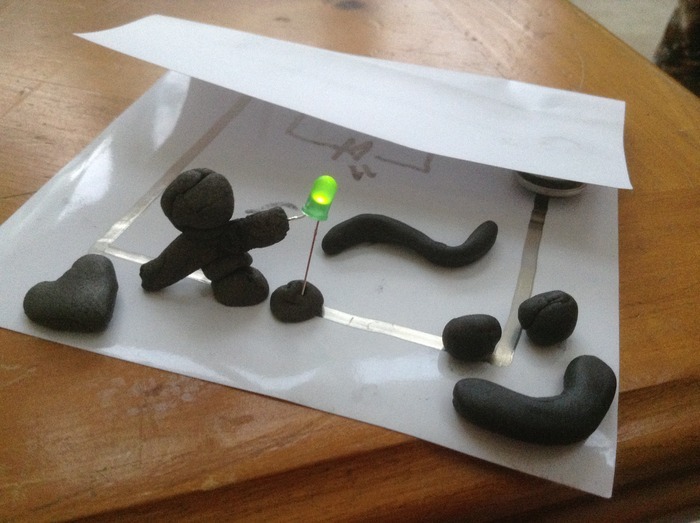 Conductac is like Blu-Tac, but conductive. Its inventor sums up what he’s aiming at: “While presenting electronics and robotics workshops as part of the quickening L.A. maker movement, I was frustrated by the lack of platforms for prototyping and creating circuits in a workshop or classroom setting. Logisitcs often disallow soldering, and breadboards are confusing and expensive for large groups of people. And while the face of circuit building is changing with innovations like Circuit Scribe and Circuit Stickers, there still isn’t a method to connect electronic components easily, quickly, and securely.” So Allen Pan sat down and made some. These sort of products are really opening up the opportunities for kids to safely make things with electronics. That safety and ease of access also make them particularly exciting in a classroom context where letting 30 young students free with soldering irons could be somewhat akin to the definition of insanity. I just love that products like these can free teachers and students to focus on the electronics and the creation rather than on the minutiae of joining two wires together.